Juice Bars: Company profiles, reviews, comments all submitted by you! Submit as many Juice Bars as you like. It's simple. Create a quick profile by filling in the form below. Once the profile is reviewed for quality, I will publish it and link back to you, sending friendly traffic your way! Be original, create provocative and captivating titles to grab attention! Are you passionate about juicing or health? Do you have experience or a savvy opinion to share? Products or services to sell? Provide sought-after guidance and earn extra income. Click here to learn how I am juicing my way to building a full-time income with a part-time hobby. Juice Bars: create a profile or write a review here! Profiles and reviews of the most favorite Juice Bars, all submitted by our readers. Own a Juice Bar? Found a cool Juice Bar that you think is amazing and it deserves a "Shot Out" by you? Write a review or create a profile for other visitors to read! 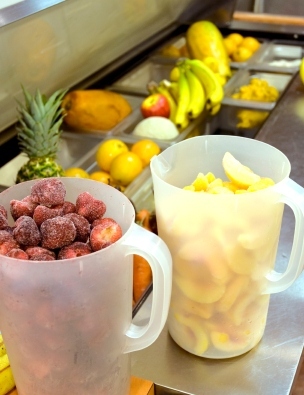 Examples: the Juice Bar, you and your favorite juice, the amazing staff, and customers!